Mississauga meet Muhammara, a seductively delicious dip originating from Aleppo, Syria but common in Lebanese cuisine. This intriguing little number has layers of flavour and texture: roasted sweet red peppers, crunchy walnuts, acidic tomato paste and lemon juice balanced by sweet and tangy pomegranate molasses, and a warm spicy heat that slowly unveils itself. A breeze to make with most items stocked in my pantry, it’s my favourite appetizer of the moment. The type of dried, crushed chili peppers you use is important here. The classic recipe uses dried Aleppo chili peppers, originating from Syria. Regular grocery store dried red chili peppers are fiery hot and lack the fruity flavour of Aleppo pepper but Aleppo pepper can be hard to come by. The Spice Trader in Toronto carries Aleppo pepper, available in their store on Queen Street West (in Trinity Bellwoods) or from their website (they just received a new shipment on Friday November 1, 2013 and are in the process of updating their website). I use Armenian pepper, sold at Adonis (under the Cedar brand in plastic packets in the spice aisle). Cedar brand Armenian pepper flakes have a fruity flavour, like raisins, and a gentle heat. You’ll find pomegranate molasses in Middle Eastern grocery stores or in the international section of some supermarkets. If you live in or close to Mississauga, a drive to Adonis will be worth the trip. You can stock your pantry with Armenian pepper, pomegranate molasses, and small jars of roasted sweet red peppers. Don’t forget to pick up a package of freshly baked Adonis pita bread from the racks under the window of their in-store bakery. There are many versions (and spellings) of muhammara. Adonis sells a good store-made version, available ready-made in mild or spicy hot (they spell it Mouhamara). My recipe is somewhere in between the Adonis version and Claudia Roden’s version (from her book The New Book of Middle Eastern Food, which is an extensive collection of good, authentic Middle Eastern recipes). Please visit my Grocery Store Directory for information on The Spice Trader and Adonis. Adapted from Claudia Roden’s The New Book of Middle Eastern Food. Perfect for holiday entertaining, this dip is colourful, healthy, and exotic. Make sure you don’t over-process; you want the slight crunch of the walnuts and tiny hits of different flavours coming at your taste buds. Alternatively, if you add a garlic clove and puree to a smooth paste, you’ll have an outstanding and healthy sandwich spread that I like to call Muhammara Mock Mayo. Add all ingredients to the bowl of a food processor; pulse several times, stopping to scrape down the sides of the processor with a rubber spatula when necessary, until mixture is processed into a rough paste; avoid over-processing. Serve immediately with toasted pita points, pita chips, or endive spears. For longer storage, seal in a plastic container and store in fridge for a few days or in the freezer for up to 2 weeks; defrost before serving. 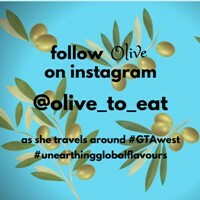 Olive Middle Eastern food. Healthy and flavourful, it always makes me feel good after I eat it. 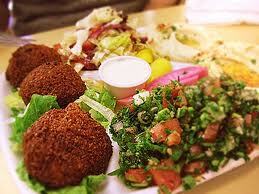 I fell in love with Middle Eastern food almost at the same moment that I fell in love with my Egyptian husband. First the husband, then his family, then the food. My husband’s family are talented cooks who love to host gastronomical extravaganzas. Every generation of the family gathers around one long table, lavishly laden with delicious food. There is lots of love, laughter, good wine and even the odd heated debate just to keep things lively. They take food seriously and whether cooking Middle Eastern, French, Spanish, Italian, British, or Quebecois, they always search out the finest ingredients and prepare them carefully. 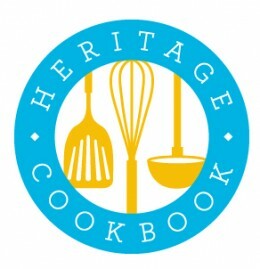 Soon we will be welcoming Southeast Asian cooking into our wonderful, multicultural clan. My mother-in-law, Mado, is a fabulous cook (and a lovely mother-in-law). Years of practice have perfected her cooking and engrained her recipes in her memory. There is nary a cookbook in sight. When I visit, I try hard to watch, translate, and learn so I can pass her recipes down to generations to come. My mouth still waters when I recall a simple barbeque she held at her home one summer evening, when I was first getting to know the family. She char-grilled whole red snappers and served them with a delicious, creamy sauce made of ground sesame paste (tahina), lemon, and garlic. It was as yummy as it was unusual. That was my introduction to tahina sauce which quickly grew in to a love affair. Olive it the most on grilled or roasted fish. It’s especially delectable with meaty salmon or trout. Olive it drizzled on grilled beef or chicken shish kebabs. Olive to let it trickle down into my rice. 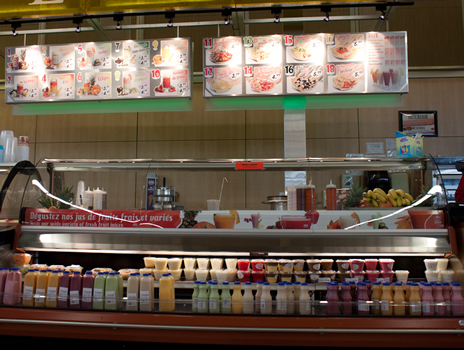 It heightens the flavour of Lebanese wrapped pita sandwiches, such as shawarma and falafel. It is essential in a good hummus and a good baba ghanoush. It is healthy and it’s so easy to make. Let me teach you how. First, let’s talk about the ingredients. Here are all of the ingredients that you will need, plus cold water. Make sure your lemons are large and roll them under your hand for a spell, to make them easier to juice. Choose four big, fresh cloves of garlic – go bold or go home (okay, do three if you feel a bit wimpy). If you can, buy your ground cumin from an Arabic store, where it has a high turnover and will be nice and fresh. Hmmm, I could smell the earthy fragrance of this cumin as I was taking this photo. This is my favourite brand of tahina paste, available at Adonis or Loblaws. Store your jar of tahina paste upside down, set in a small bowl, in your cupboard. This will allow the oil on top to rise up through the paste, making it much easier to stir. It will keep in your cupboard for far longer than it will take for you to use it up. Because the paste is so thick, it is very important to stir tahina paste thoroughly before measuring it, to break up any clumps and to mix the oil in completely. Now, a bit about the method. Tahina sauce needs to be blended properly with cold water. Mado always mixes it by hand, adding the water bit by bit and stirring while it breaks apart, then continuing to stir until it comes back together into a creamy blend. I get the same results in a food processor. I like to make a batch of tahina sauce at the beginning of the week to serve with grilled fish. And then I use some to make baba ghanoush or hummus later on in the week. If there is any left over at the end of the week, we like to drizzle it over store-bought rotisserie chicken. Before measuring the tahina paste, stir it very well to break up any hard chunks and blend thoroughly. Place the tahina in a medium bowl. Add the cold water, bit by bit, stirring each time. The tahina will separate and stiffen. Continue slowly adding the water (about 1 cup to 1 1/4 cups of water in total) and stirring until the tahina and water come back together into a creamy, pale sauce. Add the lemon, salt, garlic, and cumin. Stir well. Adjust the salt to taste, to bring out a punch of lemon and garlic. Add more lemon, if necessary. Garnish with a light sprinkle of cumin. Store in the refrigerator. Before measuring the tahina paste, stir it very well to break up any hard chunks and blend thoroughly. Place all of the ingredients, except for the water, in a food processor. Add the water slowly, using just enough to end up with a pale, smooth, creamy sauce (about 1 cup to 1 1/4 cups of water in total). The tahina will separate and stiffen at first and then become smooth. Adjust the salt to taste, to bring out a punch of lemon and garlic. Add more lemon, if necessary. Garnish with a light sprinkle of cumin. Store in the refrigerator. Place fillets on a large piece of heavy-duty aluminum foil. Turn up the edges of the foil to make a rim (so that the oil doesn’t leak out on to your grill). Dress the fillets with a light drizzle of extra-virgin olive oil, a sprinkling of kosher salt, a grinding of black pepper, and a dusting of dried marjoram. Grill the fish on the foil, at 425 degrees, until white proteins start to come to the surface and the fish is done to your liking. It will continue to cook a bit as it rests off of the grill. Alternatively, place on a baking sheet and roast in a 425 degree oven. Serve with a drizzle of tahina sauce and garnish with grilled lemons or fresh lemon halves. Cut some lemons in half. Toss in some olive oil. Place, cut side down, on a grill and grill for as long as the fish cooks, until slightly charred. Serve as a garnish for fish. Use caution when squeezing to avoid being burned by the hot juice. One last thing. After every fish dinner, Mado recites “Après le poisson, il faut le dessert” (after fish, you must have dessert). And so I am leaving you with a little treat. Adonis Rodin Mangue mango mousse – 250 decadent grams of sheer heaven. Made of luscious mango pulp, sugar, gelatin, and crème frâiche. Enough to share. The perfect treat after fish! Olive it! 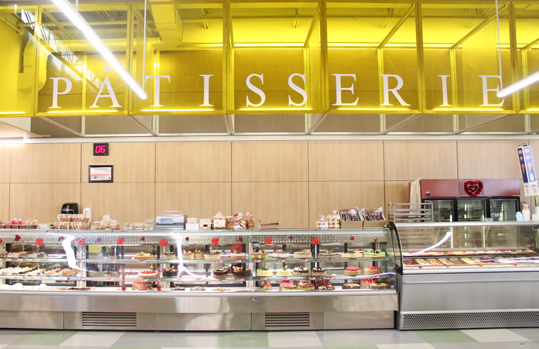 Adonis Mississauga opened today and it is every bit as fabulous as the Adonis grocery stores in Montreal. My heart is just a flutterin’! Adonis has pulled out all of the stops for their first Ontario store. I can’t possibly fit all that olive about Adonis in one post. And the store was jam packed today so it was difficult to take good photos. Tonight, I will leave you with this. 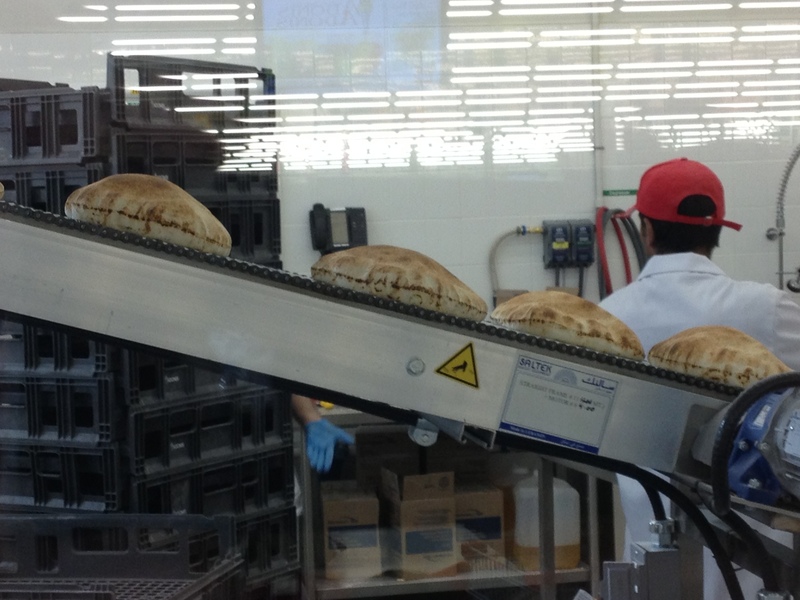 On your first visit to Adonis, make sure that you buy some Adonis Pita Bread. 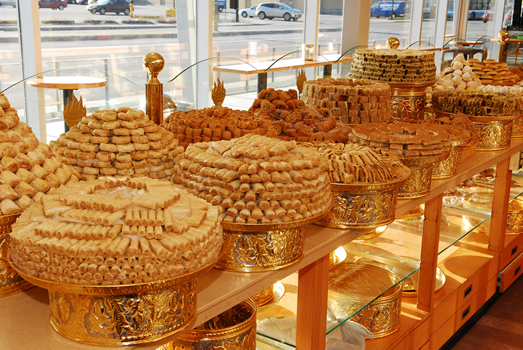 Adonis Mississauga has an in-store bakery where they bake their own pita bread. Look at it, all puffed up and freshly baked, in the photo below. It is the softest, freshest store-bought pita bread that I have ever tasted. And it’s thin too, so you don’t end up with too much bread in your sandwich. Make sure you look for the Adonis brand because there are several other brands available also. Next treat yourself to the BBQ Beef Plate. 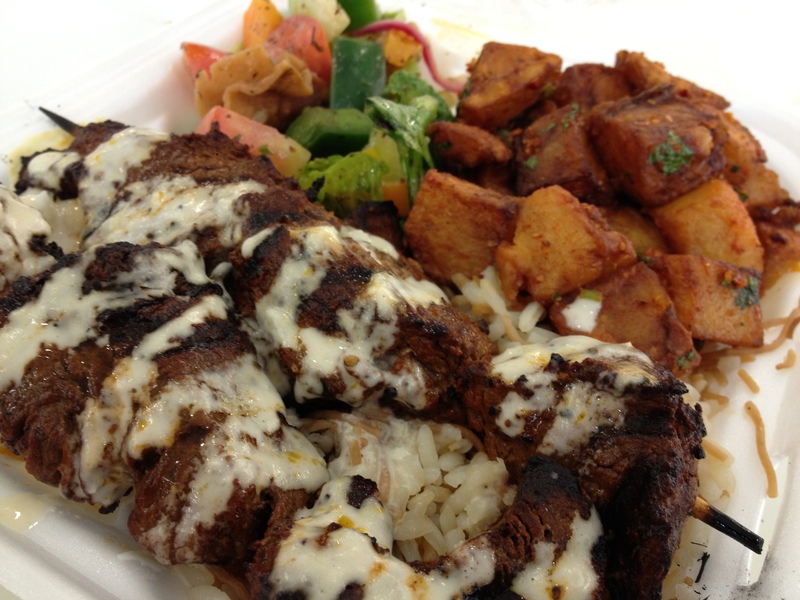 You quite possibly have never tasted Beef Shish Kebab this good. 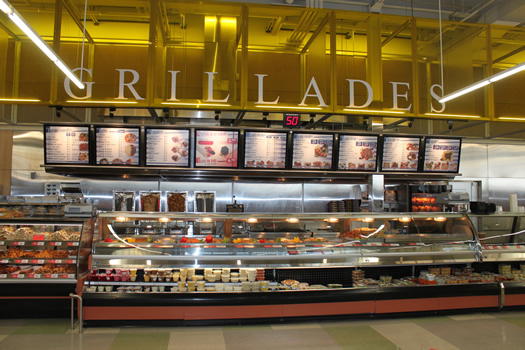 Adonis marinades beef tenderloin and grills it in the store. It is incredibly tender and flavourful. Adonis sells raw, marinated, cubed beef tenderloin (the same beef they use for their BBQ Beef Plate) that you can take home and grill yourself. They also sell raw, wine marinated beef tenderloin. Ooh la la. We will have to try that one. Sit down in the little bistro seating area and enjoy your dinner. Succulent beef drizzled with tahina sauce, sitting on a bed of rice with vermicelli (Roz bil Shaghria). It comes with delicious sautéed potatoes, which are flecked with fresh coriander, and a choice of salad. I chose a crunchy salad of romaine, fresh peppers, tomatoes, cucumbers and fried pita that was dressed with oil, lemon, garlic, parsley, mint, and ground sumac (Fattoush). The plate includes a side of hummus and garlic mayonnaise. 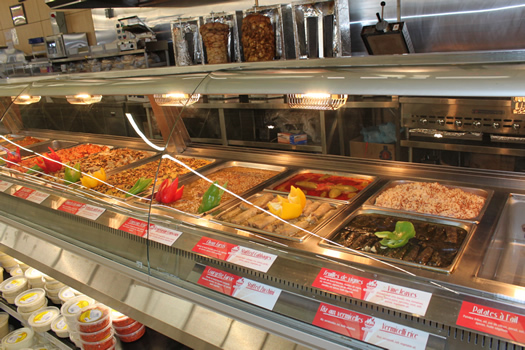 While the focus is on Mediterranean cuisine, Adonis Mississauga also carries products from other cultures. Stay tuned to my blog as I unearth treasure after treasure at Adonis. 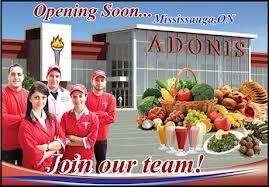 Mississauga, we are very lucky to have Adonis in our midst.